Just because you’re out traveling in your RV doesn’t mean you can’t make your home on wheels just as festive as you would back at your brick-and-mortar abode. 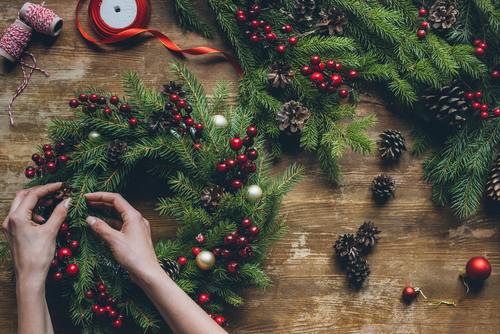 From an easy to make wreath that you can hang on your door to lights you can string up along your awning, here are some great ideas for a DIY holiday wreath and other holiday decor. Bring along a bare grapevine wreath form, a hot glue gun, and clear glue sticks, plus a wreath hanger for the door or use ribbon to hang the wreath inside. Decorate it with fresh cut pine or cedar springs and pine cones. Add decorative items including Christmas balls and a variety of miniature ornaments. Depending on where you’re traveling and stops made along the way, you can be creative and make your own holiday decorations. If you have access to pine needles and pine cones, fill up a bag and get ready to decorate. Line a basket with green or red tissue paper then fill it with pine cones and needles. You can also add a dab of glue to the ends of the cones and sprinkle with gold glitter or lightly spray the tips with white to simulate snow. Add a few miniature Christmas bulbs to the basket and viola! You have a beautiful centerpiece. Before leaving, stop at your favorite store and pick up an assortment of candles and decorations such as Christmas trees, snowmen, or any other holiday decoration that is powered by LED batteries. Sit these around the RV, near a window, on the table, wherever you want to spread holiday cheer. You can’t have too much holiday brightness. String twinkling lights anywhere possible, inside and outside, to light up the night sky for Santa.